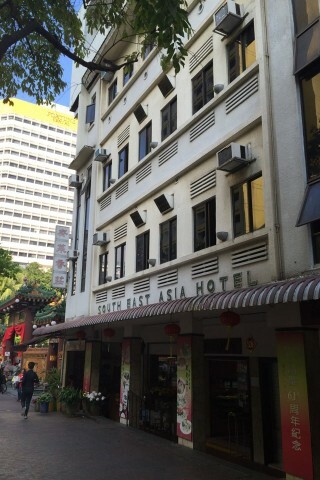 It takes a certain type of traveller to appreciate an old-school Chinese hotel like the South East Asia Hotel. Set towards the northern end of Waterloo Street, right by Kwan Im Thong Hood Cho Temple and atop a very popular restaurant you’re right in the heart of things. Established in the 1950s, this family-run hotel is old-school in just about every way. Clunky old air-con units, coin-operated scales by the lift, hand written reservation ledgers and mini TVs stuck up the top of the walls. On the upside, one of the advantages of being old school is the generous size of the rooms. If you’ve grown weary on the shoebox style of modern Singapore hotels, the South East Asia hotel will strike you as decidedly spacious. We went for a third floor room that overlooked Waterloo Street -- only one of the windows could be opened, but the setting was comfortable enough, with a desk, chair and kettle (though no coffee or tea!). The hotel offers WiFi, but it is not free -- charging S$3 per hour seems ridiculous in Singapore and we took this to mean the hotel would just prefer you don’t use WiFi, so we didn’t. Rooms are carpeted and while the bedding is very basic, the beds are firm -- ours even had a bed light. The rooms which overlook Waterloo Street have smaller bathrooms than those back off the street but are otherwise the same. The hot water comes -- eventually -- be patient. Staff are friendly and helpful for directions and advice on the area -- reservations are only accepted direct -- telephone, email or via their website -- and no credit cards, this is a cash only establishment (remember, old-school). They also run the ground floor Chinese vegetarian restaurant, which we didn’t try but it is popular. Rates include a simple Chinese buffet in a ground floor alcove. For many the South East Asia Hotel will be too rundown and frumpy, but if you like the older style, and want a bigger room, the hotel’s location is excellent. You’re minutes from Bugis SMRT and only a couple minutes more to Bras Basah. You’re also easy walking distance to many of Singapore’s downtown sights. We’d stay here again, but we really wish they’d sort out some free WiFi. If you’re looking for something more modern (though with smaller rooms) the Big Hotel is only a short walk away.